What are some unconventional ways of creating data visualizations? D3 solves a prime problem for many developers and analysts: efficient manipulation of documents based on data. Now that you know a little bit about D3, you are probably asking, where the heck do we host the thing? We could go the route of hosting it on our own server, but I’d prefer not to add more work to this. Wouldn’t it be great if it could all just be done through Google?… …. … Lightbulb! Discover how to host on the web through Google Apps Script here. I’ve recently fallen in love with Google Apps Scripts. As I was looking into how I could host through Google, I stumbled across the ability to share a web page. Isn’t it nice when everything comes together? With hosting out of the way, we can finally get to the fun part: building! The idea here is that we have a “Page Category” consisting of several “Landing Pages” and I could provide TY, LM or LY as date ranges; all arbitrary, but I figured this way I could add Month over Month and Year over Year if I felt ambitious later. 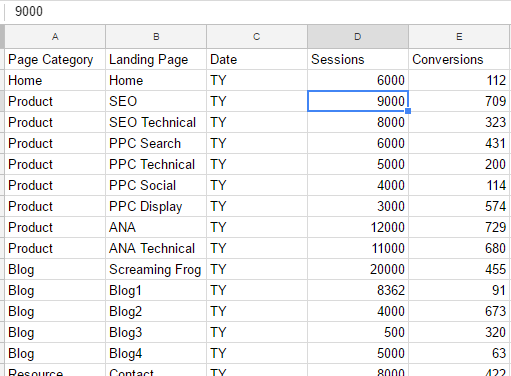 Then, I made up some sessions and conversions so I had some data. Boom, done. 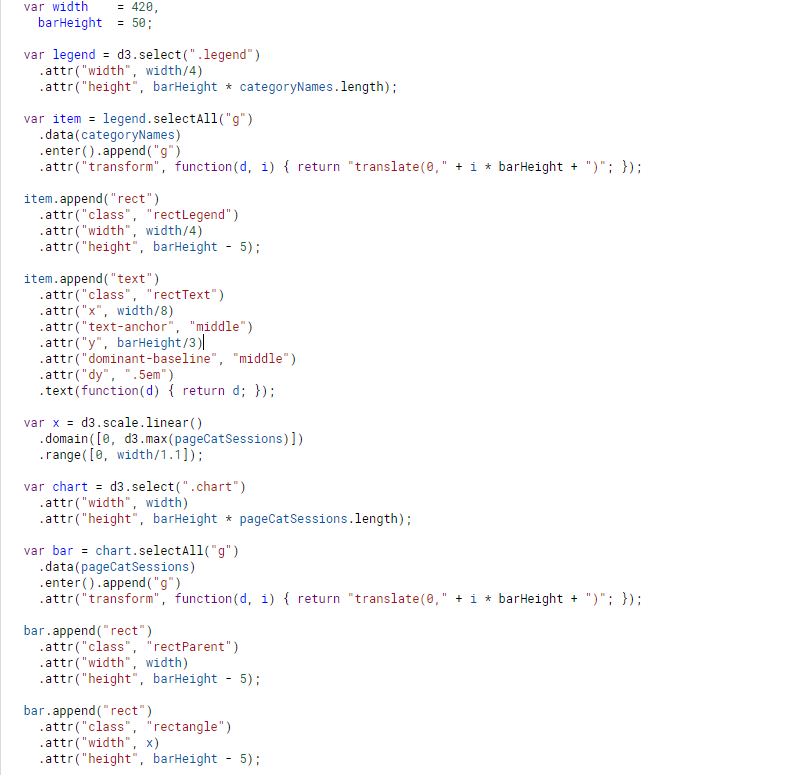 All this code does is create a function called getData that gets the data from either the current active sheet or any sheet name I provide and returns that data. We could parse the data here, but I figured I would take care of that later. Alright, this project is flying along! Next, we’ll create a new file called index.html. This will be our site going forward. To create the new site, click File -> New and select Html file from the drop down. When prompted, you can name it anything you like. Selecting your new html file, you’ll have most of a website setup for you! There are a few things we’ll want to add at this step. First, we’ll need the D3 library. It would be hard to work with D3 without it! I also chose to add in jQuery because I like jQuery, but it’s not necessary for this walkthrough. Now, to view the website, just click Publish -> Deploy as Web App … and fill in the next page (note: you can set who has access to the app at the bottom!). Hit publish and!… Error. Okay, still a little more work to do here apparently. Let’s head back to Code.gs. Apparently, every site needs a doGet function in order to run, so we’ll add that in now! Alright, let’s try publishing again. You should now have a working website! Woohoo! Finally, we get to mess around with D3! I’m not going to try to reinvent the wheel by giving you the basics here, but I recommend going through the Tutorials offered on the site. Specifically, I went through the first 5 tutorials, including the intro (I’ll admit I skimmed it), all 3 parts of the Bar Charts tutorial, and the one about making a circle, since that encompassed everything I thought I’d need to know. After all, I’m just making a bar chart with some circles in it. How hard can it be? Ok, first up, we’ll be adding main.js.html to our project. The purpose of this file is to have one spot we can keep all of our JS code for easy editing. Create a new html file File -> New -> Html file and call it main.js.html. Next, you can delete everything that’s there and replace it with an open and closing <script> tag. google.script.run.withSuccessHandler is a function that can be used to pass data from the Apps Script to our html document. Since the Google Sheet has additional sheets added to it, we could select which data we wanted (hence that “name” parameter added to the function back in step 2). For now, there’s only one set of data, so the selectData function is a little pointless, but I like to plan ahead. All this function does is call the function to create the chart. Here is where things start to get a little hacky. It had been a long day of coding to get to this point, so I’ll do my best to break down my reasoning one step at a time, but I’m sure there are better ways to do this. I also set up my categoryNames and pageCats arrays for easy referencing later. Again, yes, there are far more elegant solutions, but this works for a proof of concept. The data from the spreadsheet comes back as a 2D array, so I’m going to loop through it once and pull out the relevant data. The empty array variables will each hold a different set of data. pageCatConversions will hold the page category conversions. 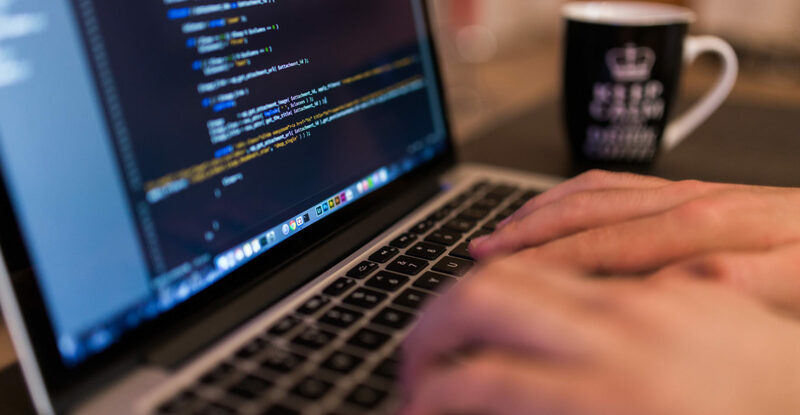 The individual landing page data will be held in the landingPageSessions and landingPageConversions arrays, respectively. 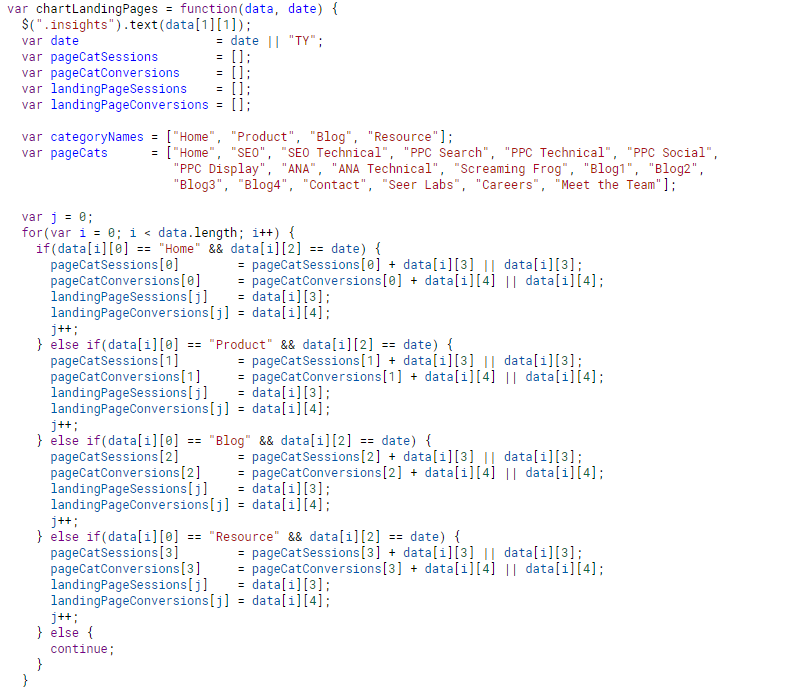 As we loop through data, we’ll us j to keep track of each unique landing page, while hard coding in the array position for each page category. With all of our data now in one dimensional arrays, we can start in on the d3 code. First, I setup the legend. We’ll get to this step shortly, but I have two svg elements in my html that I’ll latch onto, one with a class called legend, and one with a class called chart. 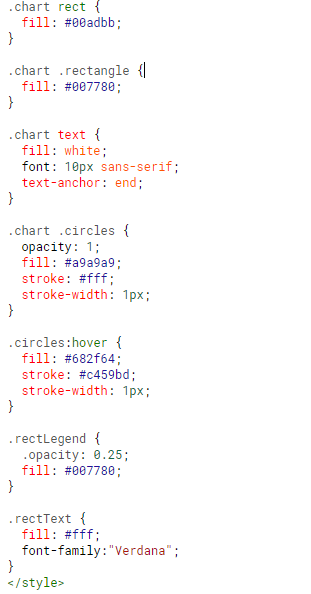 Here, d3.select(“.legend”) is latching onto the legend svg element and setting it up. Within that svg element, we create some “g” elements and attach our data. No need for any visualization here, just binding data so it shows the legend. Now, set up the bar chart. The tricky part here is knowing which data to attach where. Also, when setting up the range portion of the scale, I decided to divide my x by 1.1 to make sure that no bar would reach 100% scale. This was a purely visual decision. Adding in the circles proved to be much trickier than setting up the horizontal bar chart. 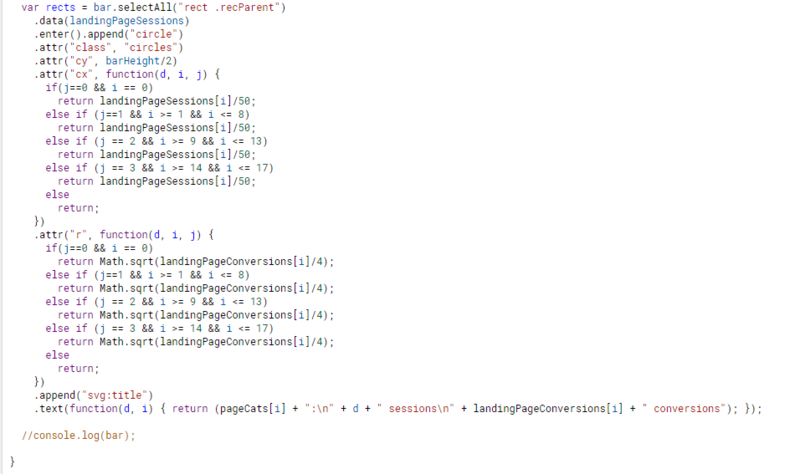 For one thing, I needed to figure out how to only include the landing pages to their associated page category. This was accomplished by a series of if statements using i and j in the functions to determine what landing page values should be returned. i and j are iterators passed into the functions where j correlates to the rectangle we’re currently in (0 is homepage, 1 is product, 2 is blog, 3 is resource) while i is the position of the data array. A little tricky, but if you throw a few console logs in each of those functions it’ll become a lot more clear. The divide by 50 and Math.sqrt are purely for aesthetic design and impact the scaling/location of the circle. Next, we’ll want to add on to our index.html web page, so our D3 select statements don’t error out. On hover, you can see a tooltip including the landing page name, and hard number values. Pretty cool, right? Try doing that in Excel! Overall, I have to say I really am impressed with the D3.js library and the awesome visualizations you can create. I think I have a long way to go towards being able to use it efficiently, but for a first pass I think this went pretty smoothly! I have some thoughts on next steps, but I’m really liking the design overall. And of course, big ups to Google Apps Scripts for being such an amazing and awesome tool! Stay up to date with our #dataviz tips and tricks (and more) by subscribing to our Newsletter below!